Written to inform practicing vocational counselors and students about the practical and applied aspects of various counseling approaches, this book will help them maintain a data-based objectivity. Contents: W.B. Walsh, S.H. 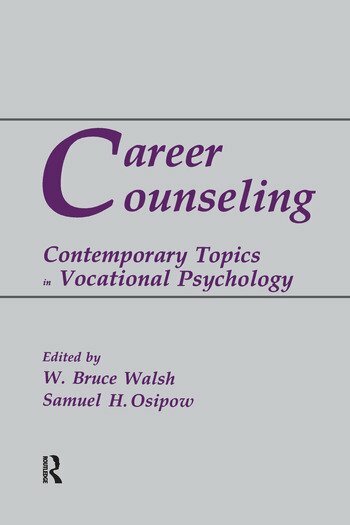 Osipow, Introduction: Approaches to Career Counseling. J.B. Rounds, T.J. Tracey, From Trait-and-Factor to Person-Environment Fit Counseling: Theory and Process. J.D. Bozarth, R. Fisher, Person-Centered Career Counseling. C.E. Watkins, Jr., M.L. Savickas, Psychodynamic Career Counseling. D. Jepsen, Developmental Career Counseling. J.D. Krumboltz, C.W. Nichols, Integrating the Social Learning Theory of Career Decision Making. F.J. Dorn, Career Counseling: A Social Psychological Perspective. J.R. Rayman, Computers and Career Counseling. W.B. Walsh, A Summary and Integration of Career Counseling Approaches. "...the strength of the volume lies in the authors' attempts to update traditional career counseling models and integrate them with recent advances in psychology, particularly in the area of information processing."